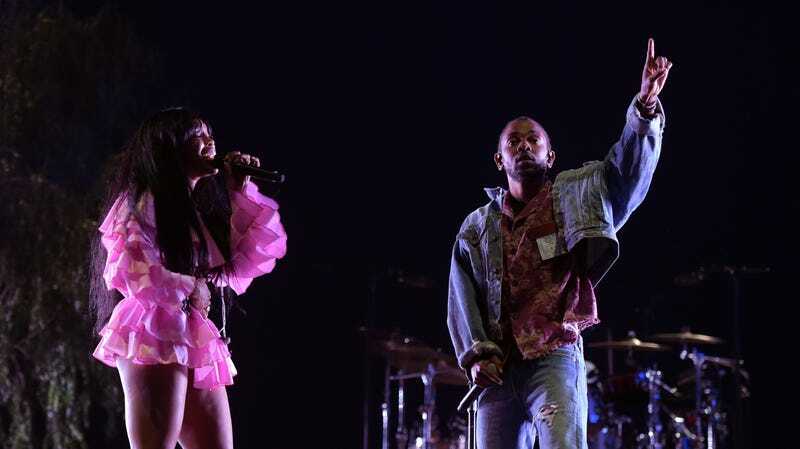 SZA and Kendrick Lamar perform onstage during the 2018 Coachella Valley Music And Arts Festival on April 13, 2018 in Indio, California. Veteran Oscar ceremony watchers know the drill—the big musical opening number isn’t the only time there’s music on display on the biggest night in the film industry. Every telecast typically features performances of their Best Original Song contenders in a showcase for the audience. The nominees for Best Original Song are “All the Stars,” performed by Kendrick Lamar & SZA (Black Panther); “Shallow,” performed by Lady Gaga (A Star Is Born); “The Place Where Lost Things Go,” performed by Emily Blunt (Mary Poppins Returns); “I’ll Fight,” performed by Jennifer Hudson (RBG); and “When a Cowboy Trades His Spurs for Wings,” performed by Tim Blake Nelson and Willie Watson (The Ballad of Buster Scruggs). But, let’s say you could only see two performances out of the list of nominees? Who would you pick? According to sources via Variety, Academy executives and show producers have picked only two performances and they are the nominated songs from Lady Gaga and Kendrick/SZA. The other songs would simply be acknowledged during the category’s nominee announcement section. Well, for one, having only two “Best Song” performances will tack off some time of an already long and a laborious telecast. If true, this seems to align with the Academy’s routine efforts to decrease airtime — keeping it under four hours, at the very least. But Variety’s sources are saying this choice could cause a rift in the music industry, since the rumored choices are under the same music label, Interscope. It would be huge for the label, but other labels may perceive it as favoritism. The Academy did not comment on the reported decision or choices, but instead noted it has not made a decision on song performances at this time. We’ll keep you posted on updates as they arise.